Before you know it, spring will be here and the fish will begin their yearly migration from the deep to the shallows. Humans act somewhat similar. They begin an annual trek from their homes to their theoretical “dream vacation of a lifetime”, an exodus of sorts. Then there’s my fishing and hunting crowd. We think along different lines than the usual group of vacationers. We’re the ones who are happy staying at a fish camp where, hopefully, the sheets are clean and we can see the water from our front door, either from our less than perfect motel room or a scenic campsite. We don’t need the complementary stationery and pens or the small bottles of shampoo and conditioner. To us, the important things are simple conveniences like good launches. The dream things are lots of fish and big numbers of bites. This makes most of our crowd happy. Last fall, I attended a conference in Dunkirk, NY. Not only was the town near to where my granddaughter was attending college at SUNY Fredonia, it was close to some great fishing, fabulous wineries, museums and historical monuments such as architect Frank Lloyd Wright’s Graycliff, a mansion overlooking Lake Erie. What always amazes me is the negative reputation New Yorkers have but how kind and generous we really are. For the bad rap we get, you can’t beat us for our ability to make others feel comfortable. Such was the case for the residents of Chautauqua County. Not only were the winery owners pleasant and generous, but in every capacity, whether it was the employees of the hotel or the fishing guides we had, they made our stay pleasurable. The fish were, also, accommodating. The different varieties of catchable fish in that region would drive most fishermen wild. If you’ve ever had a muskie take a run with your line, you know what I’m talking about and Chautauqua Lake, just a stone throw from Dunkirk has big muskies. They attack various lures, not just the usual muskie baits. Back a few years ago, a friend caught a giant muskie on a Zara Spook while I got one on a jig and pig (a bass bait). Go figure. Once during a bass tournament on Chautauqua, a fellow angler caught two largemouths over six pounds each off the weed edges at the north end. Then, during a State B.A.S.S. Federation tournament, an angler caught multiple limits of smallmouth off another section of weed edge in the same end. That’s what’s great about Chautauqua. Largemouth and smallmouth inhabit both ends of the lake and are catchable over deeper water in the north end and in the shallow weed beds in the south end. As a smallmouth lake, though, you can’t beat Erie. Big five pound smallies are common and many exceed that weight. Plus, the early season catch and release where you get to keep one fish per day is a big hit with Erie’s anglers. For the many drift fishermen, Erie has shoals off VanBuren Point west of Dunkirk, then to the east, just west of Cattaraugus Creek. These shoals hold good numbers of smallmouth and early run walleye. Green, melon pepper and green-pumpkin tubes, weighted for wind conditions and drifted over the tops and off the drops of the shoals can catch either specie. 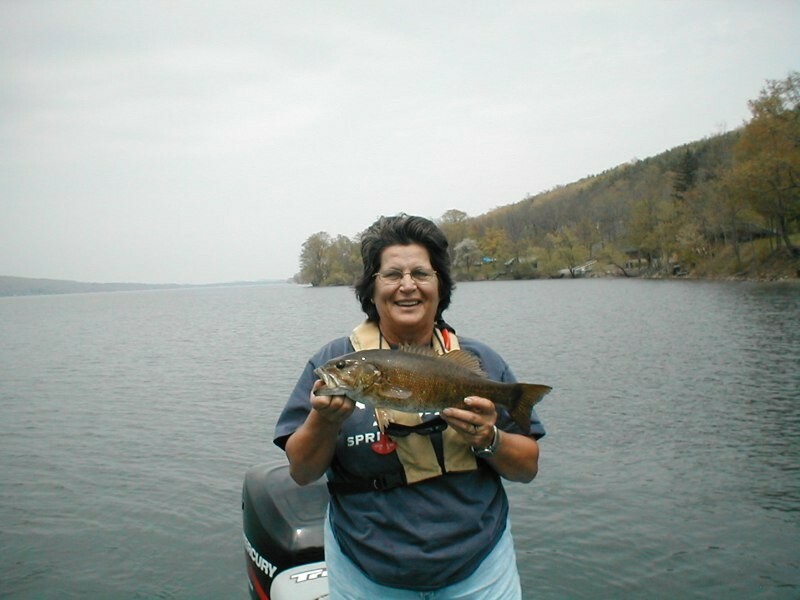 Drum, though not the fish most bass anglers want to catch, is also plentiful and lots of fun for a novice angler. Within a short drive of Dunkirk’s good launch is another at Barcelona, and between the two launches is the Lake Erie State Park where camp sites and beautiful cabins provide scenic views of the lake. Passing ships and nearby stream fishermen make exceptional photo opportunities for the novice photographer. One of Lake Erie’s drawbacks is that it’s a shallow lake and tends to blow up easily. Wave crests reach unfishable heights, so it’s best to have a back up plan like fishing in Dunkirk’s protected harbor at the power plant’s warm water discharge. Smaller nearby Cassadaga Lake, a two lake system, has a good largemouth population, as does Bear Lake. Your best bet for catching fish in these lakes is to call ahead to local tackle shops and inquire as to the live or artificial baits that are catching your fish of choice. If fishing with a guide is what you prefer, the area has exceptional guides available if you book with them early enough to get your dates. Terry Jones at www.1stclass-bass.com, Dan Dietzen (716-672-5868), Craig Robbins (716-969-9059), and Jim Hanley (716-312-0418) are all excellent guides for Erie. For the upper and lower Niagara River, Ernie Calandrelli (716-284-2335) and Frank Campbell (716-284-8546) are great. Craig is the one I’d call for Chautauqua, though. Stream fishing is another option for an angler. The two most popular creeks for trout are Canaday Creek just west of Dunkirk and Chautauqua Creek to the west of Barcelona Harbor. Both get heavy pressure but produce good steelies. In looking at the Dunkirk/Chautauqua County area as an ideal vacation/fishing destination, it has almost every entertainment imaginable. Six flags Darien Lake is not a too distant drive if you have children. There’s whitewater rafting for Mom and fishing for Dad. What more could you want? Pizza? There are great choices for that, too.